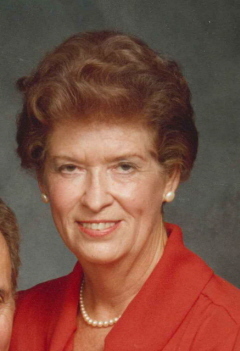 Death came peacefully to Alice Hollowell Bogard, 91, on August 18th at the Willow Valley Lakes Retirement Community outside of Lancaster, PA. She was the widow of Rev. William Carl Bogard, who preceded her in death in 2010. Born a coal miner’s daughter on October 1, 1919, in Denning, Arkansas, she graduated in 1939 from the College of the Ozarks (a self-help college) – now the University of the Ozarks – where she was voted “Best all-around girl” and “Best girl athlete.” Before and after her graduation, with notable skill in shorthand and typing, she worked as a secretary to the President of the college. On the college tennis courts she met her future husband, Carl Bogard, 10 years her senior, who as a missionary was stationed at the college. She and Carl enjoyed playing tennis together throughout their married lives. In 1941 she went to Washington, D.C., to serve as a secretary to a colonel in the Army’s Quartermaster Corps. On July 3, 1942, she married Bogard and moved with him to Butler, PA, where he became Pastor of the First Presbyterian Church and where they lived for 28 years. With the independent spirit that characterized her life, she declined to perform some of the unpaid but customary duties of a minister’s wife, such as leading Sunday school classes and Bible studies, but she otherwise played a supporting role to his pastorate. She gave birth to four children, two sons and two daughters, who spent their childhoods in Butler and went on to complete masters’ degrees. In 1970 she moved to Wilmington, DE, where her husband became Associate Pastor of the Red Clay Creek Presbyterian Church. At age 51, her children grown, she took a job with the Du Pont Company where she worked for 15 years as secretary to the Manager of Equal Employment Opportunity in the Personnel Department. With her employee’s membership at the Du Pont Country Club, she and her husband, both singly and paired as doubles partners, won numerous championships in club tennis competition. She will be sorely missed by her surviving children: Nicholas Bogard of Weston, MA; Roger Bogard of Hector, NY; and Carol Bogard of Wilton, CT. Also eight grandchildren and nine great-grandchildren. She was preceded in death by her sisters, Mary Henry and Leona Gogley, and in 2007 by her oldest daughter, Phyllis Bogard Eilenfeldt of New York, NY. A memorial service will be held this Saturday, August 27th, at 2:00 p.m. in the Thomas Auditorium at Willow Valley Lakes Manor, 300 Willow Valley Lakes Drive, Willow Street, PA 17584. In lieu of flowers, the family requests that contributions be made to IFOPA, P.O. Box 196217, Winter Springs, FL 32719.